A vacation that is not your same-old, same-old awaits 189 miles (about 3 hrs., 20 min.) northwest of Chicago. It is Spring Green, WI where renowned architect Frank Lloyd Wright built Taliesin, his primary home and studio on his family’s 800 acre estate on the Wisconsin River. You can see his prairie-style home and the Visitor Center he designed from the road. 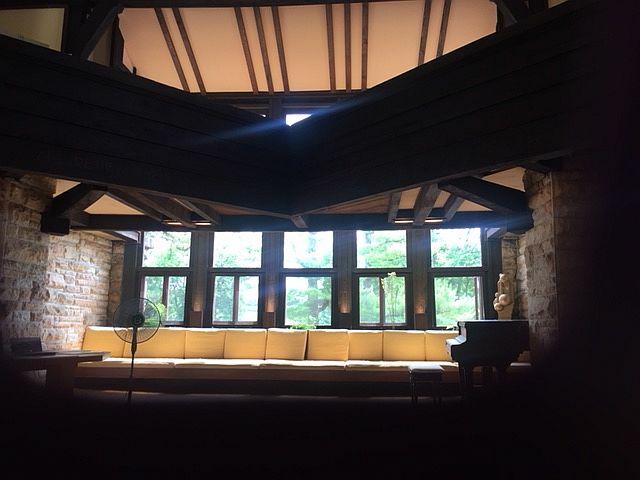 Call 877-588-7900 or visit Taliesin tours to find out how to see the estate and make a reservation. Down the road from Taliesin and about four miles south of Spring Green’s shopping area is the American Players Theatre which attracts actors, directors and choreographers from TV, film and regional theatres who need some stage time to go back to what they really love. They put on classic plays from late spring to early fall. For the season’s schedule and tickets call 608-588-2361 and visit APT. Spring Green is also home to The House on the Rock, a crazy-looking, built-into-a rocky-slope building. It contains an amazing collection of automated music machines and other stuff that fill three sections and needs three hours if doing the entire place. To find out more call 608-935-3639 and visit House on the Rock. 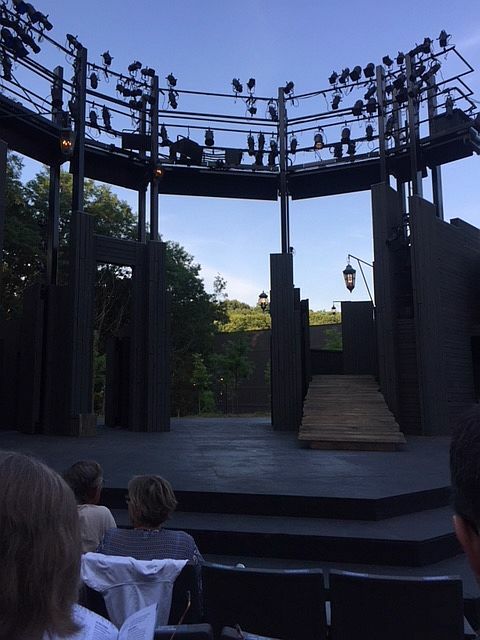 As the sun sets behind American Players Theatre the seats start to fill. The town is surrounded by forests and farmland so visitors will be treated to true farm to table products that are not just a nod to today’s popular menu phrases. There are lots of good-eating places including the small café at the Spring Green General Store which is a destination experience in itself. Go for breakfast before shopping in the store for gifts and clothing or touring local sights or go for lunch between shopping at Arcadia Books and the town’s galleries and boutiques. For dinner try The Old Feed Mill, a restored 1857 stone mill with good food and views. 608-795-4909. As to where to golf, swim and drop the bags consider The House on the Rock Resort. Rooms at the resort overlook some great golf holes. The Springs Course’s 18 holes were designed by Robert Trent Jones, Sr. and the North Nine designed by Roger Packard and Andy North, North Nine. The resort features indoor pools including a lap pool and an outdoor pool. For more information call 608-588-7000 and visit The House on the Rock.